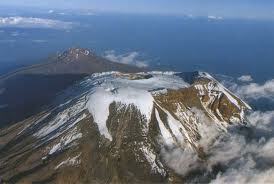 Mt Meru is a real gem of a mountain and is often ignored by trekkers who only seem intent on climbing Kili. 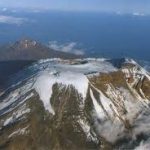 Meru is the second highest mountain in Tanzania at 4,565 m. There are great views down to the subsidiary cinder cone on the crater floor and of course across to Kilimanjaro for the next climb. Combining trekking to the summits of the Africa’s continent’s highest and fifth highest peaks. Starting with the beautiful ascent of Mt. 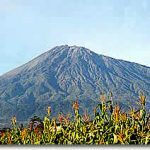 Meru – an exceptional crater rim roller – coaster warm up and acclimatization trek for the big one – Mount Kilimanjaro on Machame route. Board Riverside shuttle bus from Nairobi at 0800 hrs and proceed to Namanga Border for formalities then to Arusha arriving at 1300hrs. Depart for Moshi at 1400hrs arriving at 1530hrs. Dinner and overnight at a hotel in Moshi or (Pick up from Kilimanajaro airport and transfer to hotel in Moshi). Transfer to the Arusha National Park. 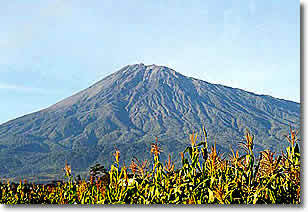 This consists of two main areas, the Ngurdoto Crater and Momella Lakes on the east side, and Mt Meru in the west, joined by a narrow strip of land. Momella Gate (2100m), the start of the trek, is in this strip. At the park gate you undergo all the various formalities of signing in, handing over your park fees and hitching up with the armed guide. Have your binoculars ready on your walk from Momella Gate to Miriakamba Hut today there is potentially alot of wildlife viewing: Buffalo, waterbuck, gazelles, zebra and a few elephant. Bird life too is excellent. Two routes are available from Momella gate. The first is a track that goes through the forest towards the crater floor, and then steeply up to Miriakamba Hut with a possible diversion onto the crater floor. The second is a path that climbs gradually through the grassland, along the lower section of the northern spur of the crater, direct to the hut. The hut is a basic timber structure in a very picturesque setting set amongst the Hagiena – Rose wood trees with views heading up Meru. Miriakamba Hut (2514 metres) consists of two large bunkhouses each with room for about 40 people. They contain bunk beds (most with mattresses) and a separate room to be used as a kitchen, although no cooking equipment is provided your cook will bring it in. There are toilets, and a good supply of water. The path climbs steeply up between the trees reaching Topela Mbogo (Buffalo swamp) after 45 minutes and Mgongo Wa Tembo (Elephant ridge) after another half an hour. There is a story that elephants slide down through the grasses and heathers directly down from the crater rim to the floor below, this may sound far fetched, but you do sometimes find their “shutes” of parted vegetation dropping improbably steeply into the crater. From the top of Elephant ridge there are great views down into the crater and up to the main cliffs below the summit. Continue up the path to Saddle Hut on a wide col between the slopes of Meru and the smaller peak of Little Meru. Saddle Hut: (3750 m) Consists of an old metal hut, used by the caretaker, and a newer bunkhouse similar to the ones at Miriakamba. There is a toilet and water is available from a stream 10 minutes away. A big day! Leave Saddle Hut very early in the morning aiming to reach the summit in time to see the sun rising from behind Kilimanjaro. The walk up to the summit, along a very narrow ridge between the sloping outer wall to the crater and the sheer cliffs of the inner wall, is not for the faint hearted. If the sunrise is your main point of interest, there’s no need to go to the top. It’s just as impressive from Rhino point (about an hour from Saddle Hut), or ever more so because you also see the main cliffs of the inner wall of the crater slowly being illuminated by the rising sun. Even though it can be below freezing just before dawn, as soon as the sun comes up the going becomes hot and hard. However during the rainy season, ice and snow can occur on this section of the route. From Rhino Point the path drops slightly then rises again to climb steeply round the edge of the rim over ash scree and bare rock patches. Continue for three to four hours to reach the summit (4566 metres). To the west, if it’s clear, you can see towards the Rift Valley, and the volcanoes of Kitumbeini and Lengai, while down below you can see the town of Arusha, and the plains of the Maasai Steppe beyond. To descend from the summit, we retrace the route round the rim, back to Saddle Hut (two to three hours) and then drop down to the Momella gate where we are collected and transferred back to Keys hotel Moshi. Dinner at Hotel. Rest Day at Keys hotel Spend a relaxing day by the pool or have a stroll around. A walk to this small town with view of the mountain is as good as it reveals. Dinner at hotel. Hopefully now you have some acclimatization. After breakfast we undertake a 45 min drive through to Machame village and then on to the National Park Gate to hand over your Park fees (unless already requested at the hotel). Park formalities dispensed with, it is about 5 hours walking today. Porters will be seen arranging their packs containing food, water, firewood and other equipment. Make sure you have all your day pack items with you because the porters travel fast and you probably won’t see them again before the evening! The guides will assist with any additional information that you need. From the park gate there is a wonderful walk up through the rain forest on a winding trail to the first hut which is located at 3048 m. Continue onto the Machame hut. Where we make camp, rest, enjoy our dinner and overnight (3100 m). After breakfast we leave the last of the Rain Forest behind and ascend, walking along a steep rocky ridge, covered with heather to the ridge end. We then turn west into a river gorge and onto the Shira Hut camp site, dinner and camp. (3840m, about 4 hours walking). From the Shira Plateau we continue to the East then our direction changes to South East towards the lava tower, called ‘The Sharks Tooth’ and shortly after the tower we come to junction which brings us up below the arrow glacier. We reach an altitude of 4876 m. But to aid acclimatization we now continue down to the Barranco hut at an altitude of (3950 m) here we rest, dine and camp. (About 6 hours walking). Top Out!! (about 11 hours walking, the hardest day) Early morning start to make the most of walking steeply over frozen volcanic screes. And to get you to the summit for the sunrise; we continue our ascent to Stella Point (5745 m) between the Rebmann and Ratzal glaciers. The last section before the rim can sometimes be snow-covered and ski poles or an ice-axe is useful for balance. We then skirt around the broad crater rim on our way to the summit (Uhuru Peak 5895 m, this part of the climb takes about 6 hours) We have now reached the highest point in Africa, giving fine views of Kilimanjaro’s crater, its stepped glaciers and Mount Meru. Mount Kenya may appear as a black pimple far to the north. From the summit we now make our descent continuing straight down to the Mweka hut camp site (3100 m). This part of the descent takes about 5 hours. Later in the evening we have our last dinner on the mountain and a well earned sleep. After breakfast continue the descent down to the Mweka Park gate, rendezvous with vehicle and then drive back to Moshi and transfer to the hotel. Night and celebratory evening meal at the Keys hotel Moshi. After Breakfast or lunch ( depending on the time of flight departure) transfer to Kilimanjaro International Airport for departure or board our Riverside shuttle bus to Nairobi. Extra day to Acclimatize Shira Hut @ US$180 per person. Transfers from Arusha or Kilimanjaro Airport and return. and 1 after the climb. Climbing gear, sleeping bags, tent/s, items of personal nature, laundry, tips and gratuities, mineral water, drinks (soft or hard), visas, travel insurance.